Great around your garden, landscaping, or yard. Group in a vase or bowl or add them to your holiday table display for an eye-catching effect. ✔ Size Avilable (Approx. ): 1.26 inch, 1.50 inch, 1.65 inch, 2 inch. ✔ Excellent For Use In Gardens, Pools, And Home Decor. ✔ Note: There is a tiny hole in the ball, hope for your understanding. 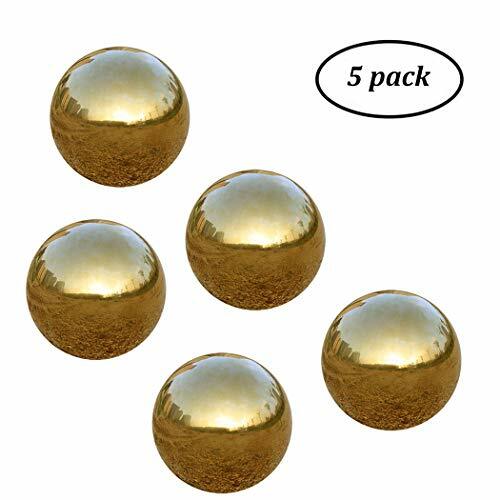 ✔ Package Included: 5x Gold Stainless Steel Gazing Ball. If you have any questions about this product by USHome, contact us by completing and submitting the form below. If you are looking for a specif part number, please include it with your message. Thailand's Gifts : Small Red Rattan Ball, Wicker Balls, DIY Vase And Bowl Filler Ornament, Decorative spheres balls, Perfect For Decoration On Any Occasion 2-2.5 inch, 12 Pcs.